So as if we do not have enough tasty and always tempting bakeries around us, here on Montana Avenue Santa Monica has added yet, another one. Nothing Bundt Cakes is their name and "scrumptious" is the name of their game. And when I quote "scrumptious," literally everyone of us here at Stephanie Grace has used that word to describe the taste of these time old tradition cakes. These bundt specialists have revolutionalized the way we think of "the bundt." No longer is the bundt cake a boring, simple sweet. 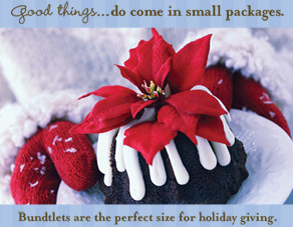 At Nothing Bundt Cakes, they offer an array of sizes an unique flavors. To include just a few of their flavors, they have chocolate chocolate chip, pecan praline, red velvet, cinnamon swirl, white chocolate strawberry, & carrot. Each bundt has the flavored cake that is fluffy and moist to perfection. Then atop the bundts, a drizzle of their creamy frosting with a hint of cream cheese finishes each bundt. 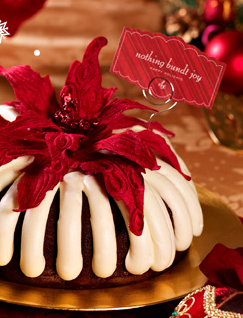 Yu-um...a trip to Nothing Bundt Cakes should most definitely be in order for those of you headed off to holiday parties!